But despite all of the heat and humidity since May, I have still managed to have some fun with friends that warrants photographs! Some highlights include our friend Pam’s stint as a dragon boat racer in the Taipei City races, a trip to the Shilin night market with a friend to introduce him to my new neighborhood, and some beautiful views of Tianzhong from my trip south to Silai to see my grandfather’s hometown in more depth and meet people who knew him and the Liao family. More posts about this trip coming soon!! But yeah, that brings us up to date. Am hunkering down with research, writing, and excessive amounts of books and photocopied articles to read, so the photos will get a whole lot less interesting quite soon. 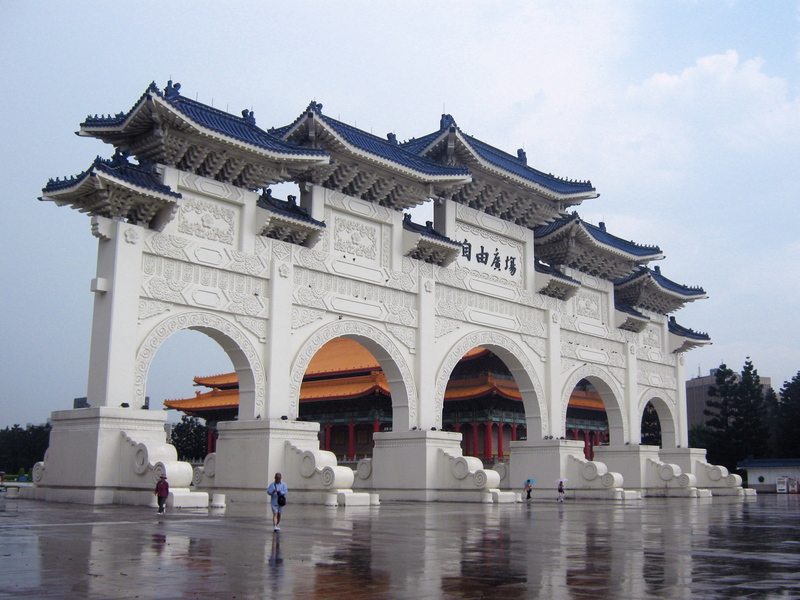 If you are in Taipei or Taiwan for these tropical months, I wish you cool dry moments, and plenty of hydration! 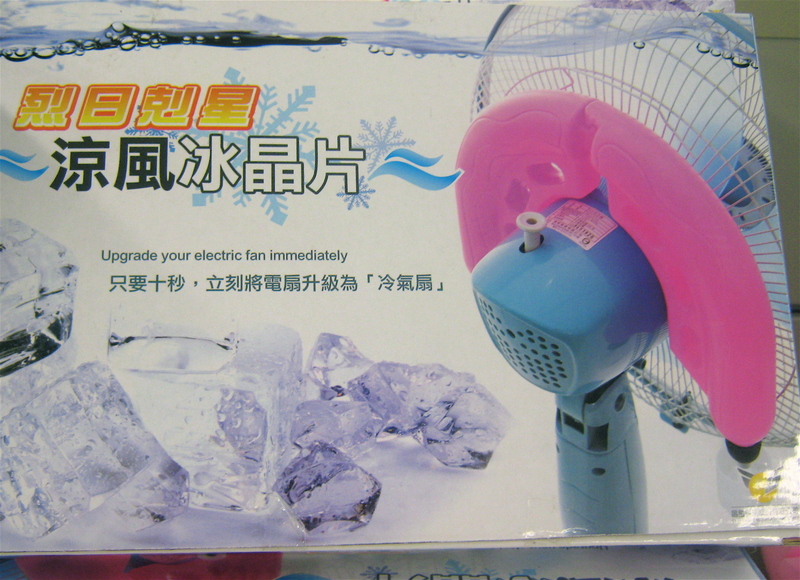 And if you have any more tips for the weathering the hot (and typhoon) season, I’d love to hear them. To everyone else, I hope that you are glad that your heat is not Taipei heat, and that your humidity is not Taipei humidity. Okay, I need another shower now, and maybe an icy cocktail. 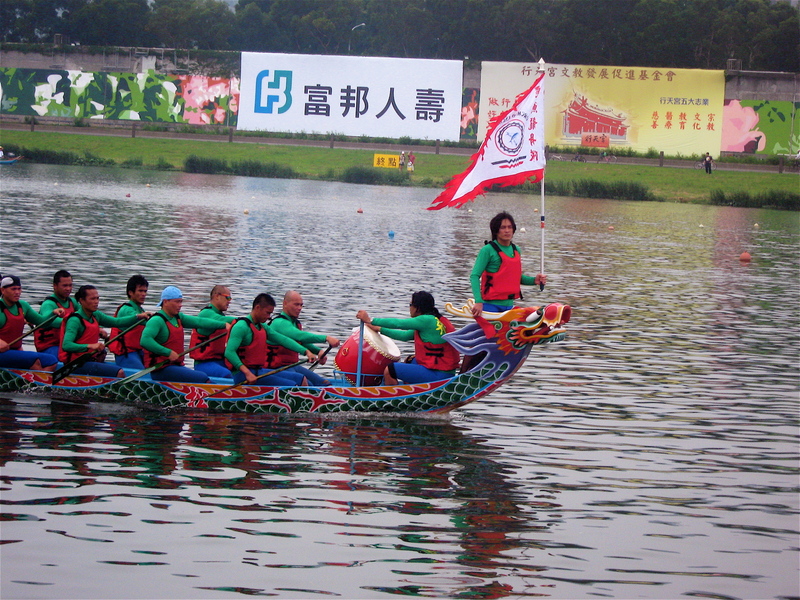 An example of a traditional-style dragon boat from the day of races. I think this team won their heat; unfortunately, the pics of Pam's team's boat were less clear. 加油! means "good luck!" or "go get 'em!" Literally it means, "add oil," as in fuel. (Fuel up, stat!) One of my Taiwanese buddies prefers to write "+oil." 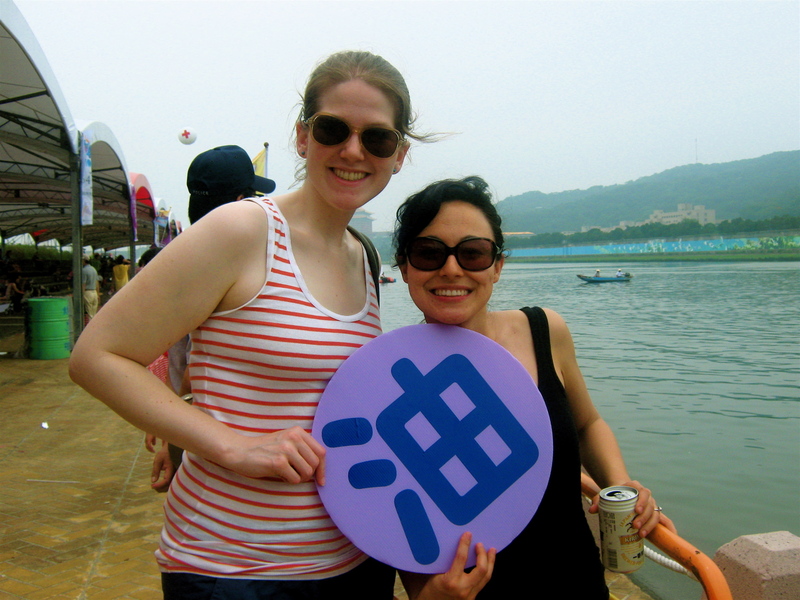 So one of us held the "加" sign, the other held "油." We were great cheerleaders, really. This sign in the MRT (subway) station always cracks me up. 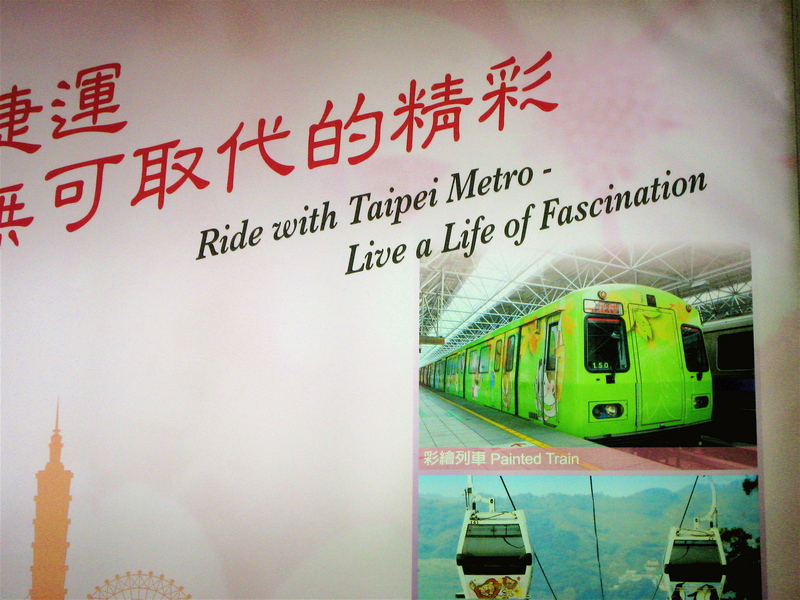 In fact, I DO live a life of fascination, BECAUSE I ride the MRT. Great logic right there. 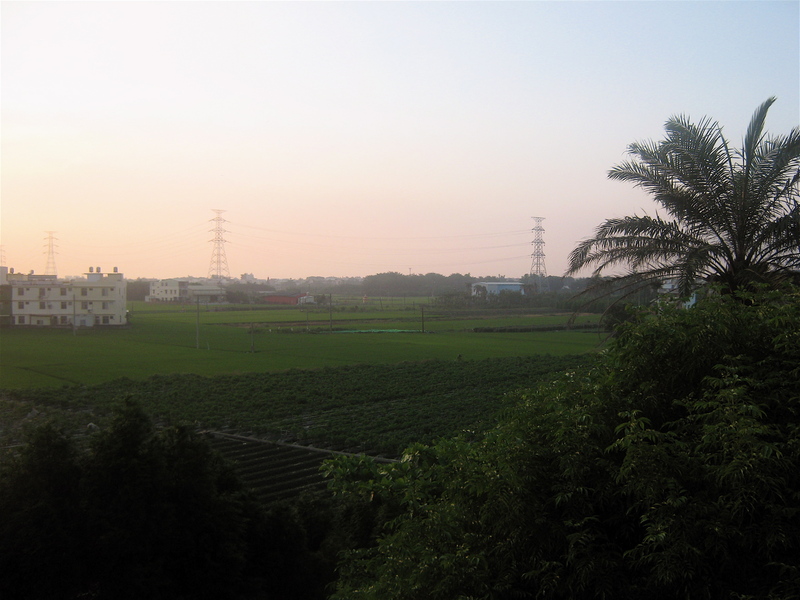 The view from the top of my wonderful host's house in Tianzhong. 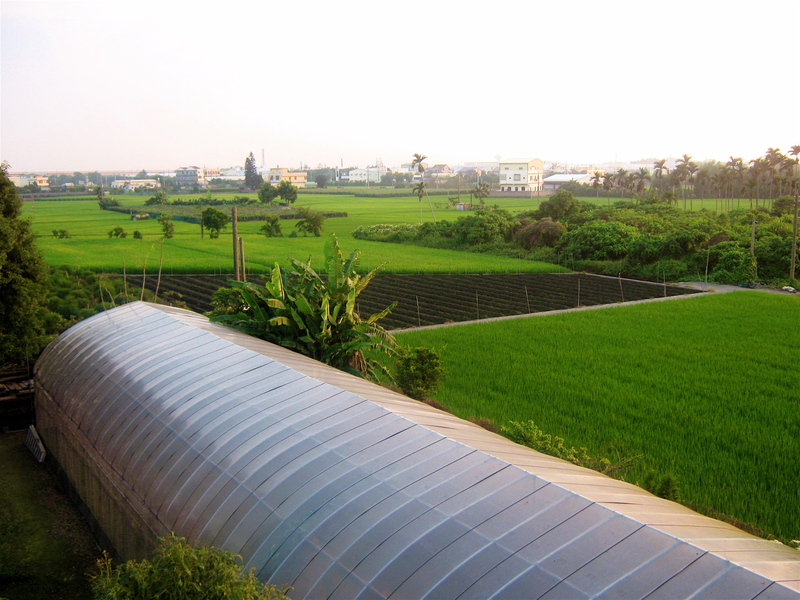 It was a 360 degree view of Taiwan farm lands. Sometimes the only thing to do is just get an icy fresh fruit smoothie. My favorite is pineapple and mango. 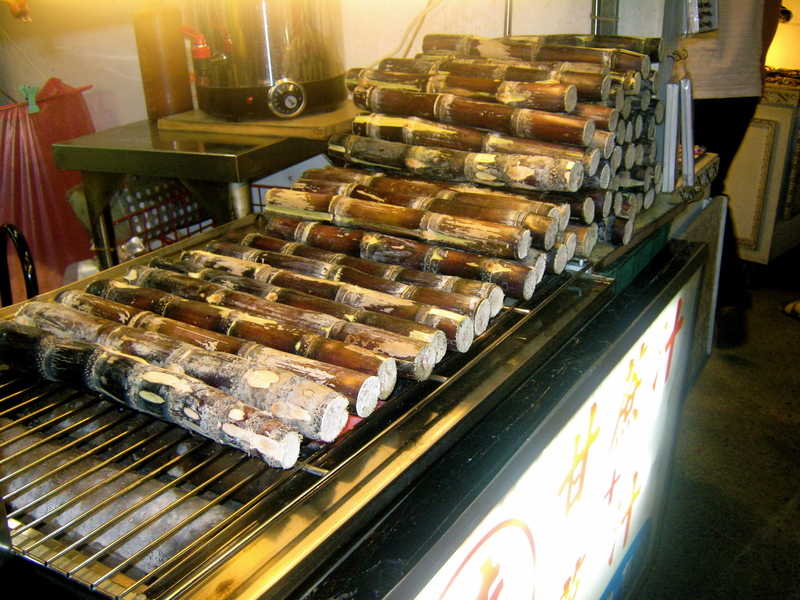 I think this sugar cane was being grilled/stored in preparation for the famous "sugar cane water," which I still have not yet tried. The cane are beautiful, but I can't imagine the flavor-- sounds too sweet for me! 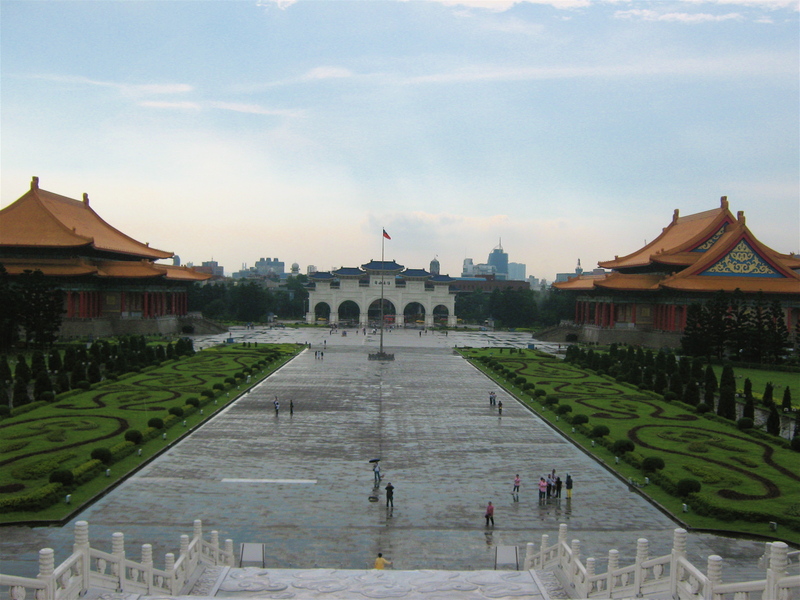 I finally went to Chiang Kai-Shek Memorial Hall, despite many months of trepidation related to Chiang's role in endangering, arresting, and threatening my family. 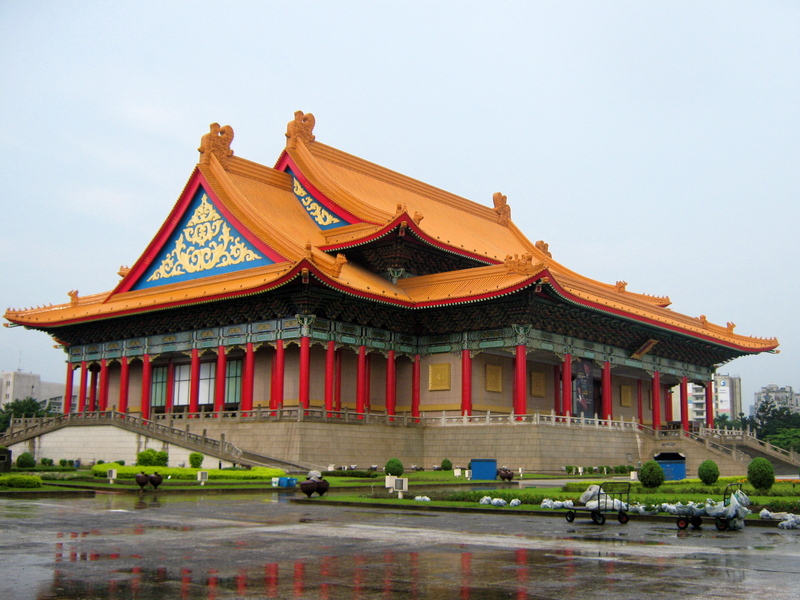 Turns out, you should always go see historic monuments in Taiwan after a rainstorm! Everything is cooled off and sparkling clean, historical ambivalence aside. Some employees taking care of the grounds stepped into view right as I took this picture. 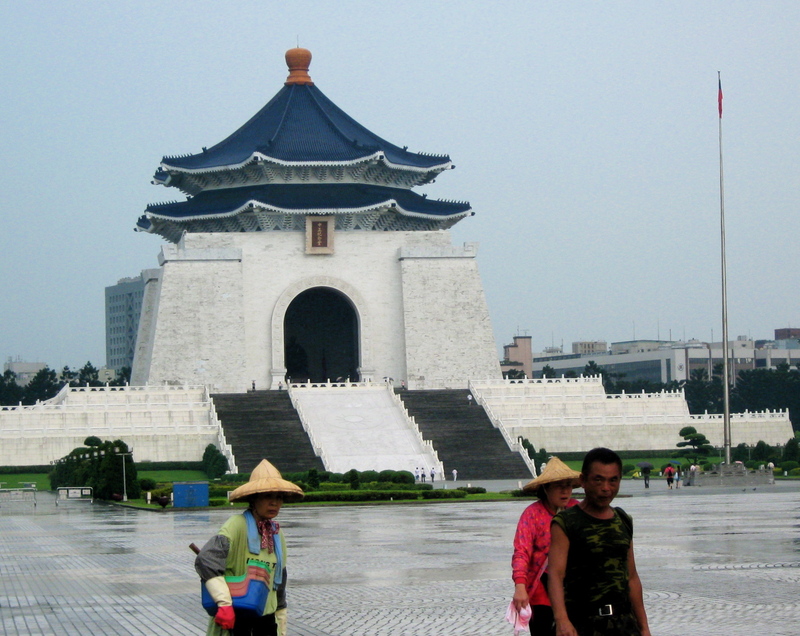 I like the contrast between them and the lofty bronze statue of Chiang Kai-Shek sitting inside his tall tower. 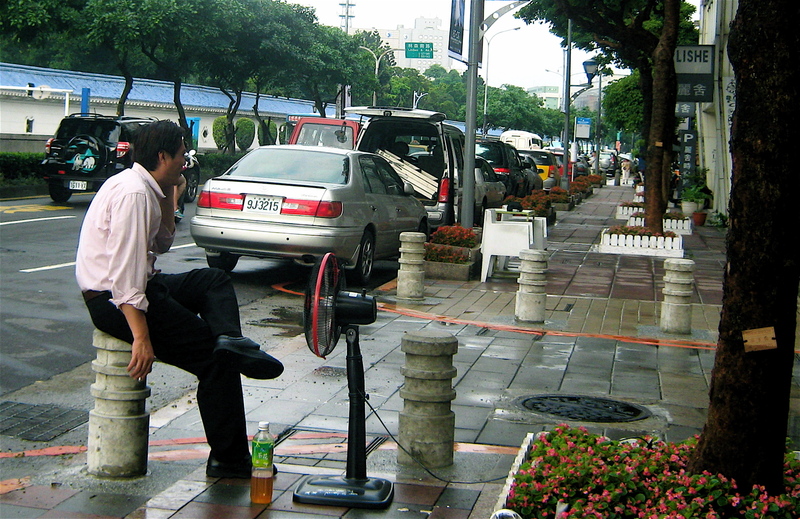 Right after leaving CKS Memorial Hall, I spotted this guy, obviously still in the middle of his work day, who took a fan out onto the street to make a phone call. If only we could each have an individual fan, or better yet, aircon! 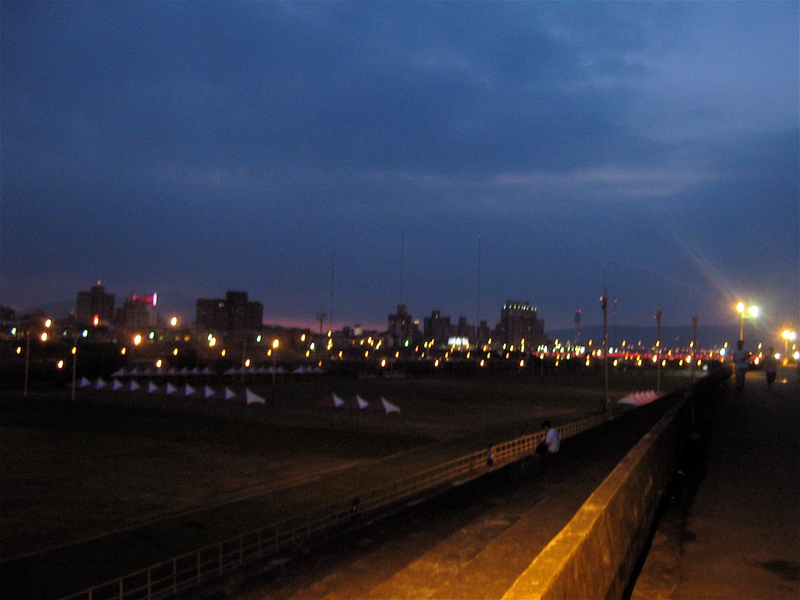 Night falls on the Jiantan River Walkway, just after sunset-- the far off mountains are still red. Hey Mom, thanks for the comment! By ceremonial “sheep,” do you mean “dragon”? 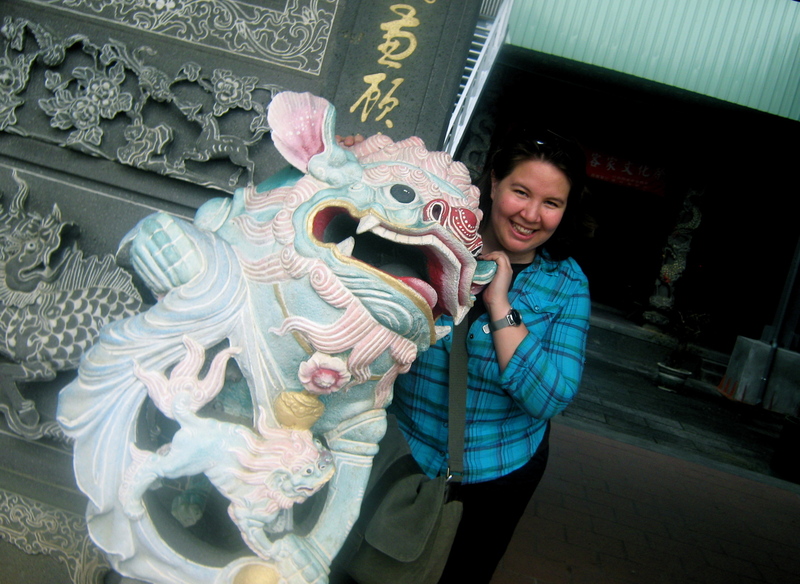 That photo was with the dragons guarding the “Liao Temple,” outside of Silai; more explanation on that soon. But I would like to get a photo with a ceremonial sheep at a future date! 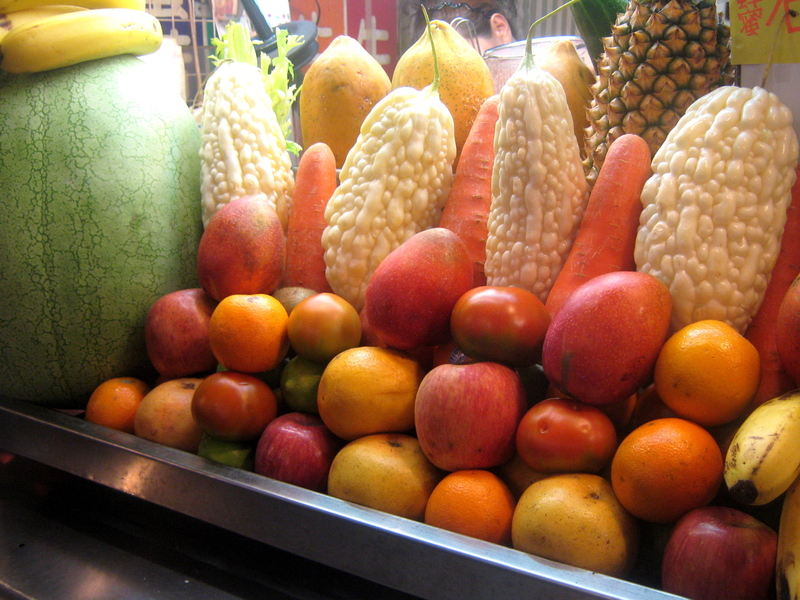 Is that bitter melon in with the pineapple and mango? Do people make smoothies out of that!? Alice, I don’t *think* that it’s bitter melon– maybe another flavor of knobby/strange-looking melon that goes well in tea or fruit smoothies? We did try a funny-sounding-melon drink once, but that was ages ago…. But I’ll ask the next time I get a fruit stand drink! 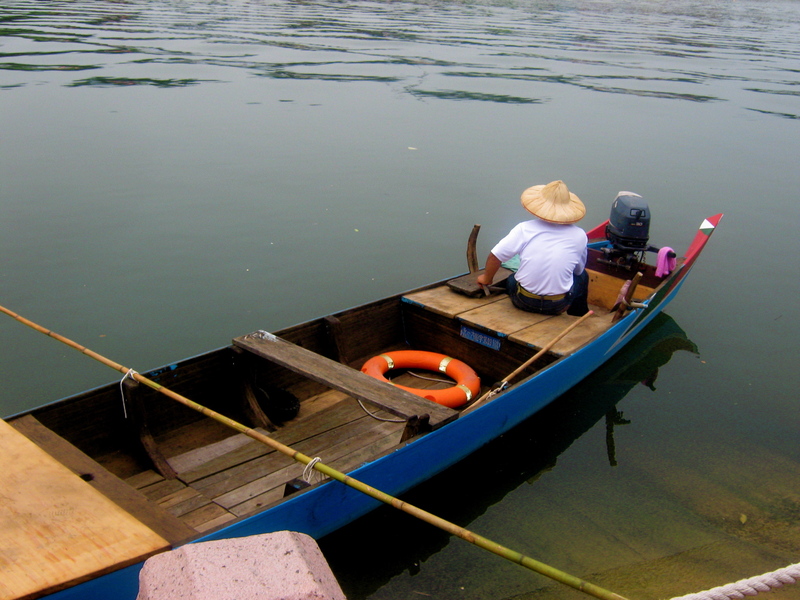 Thank you for sharing,the word 加油 is the meaning, nice pictures.